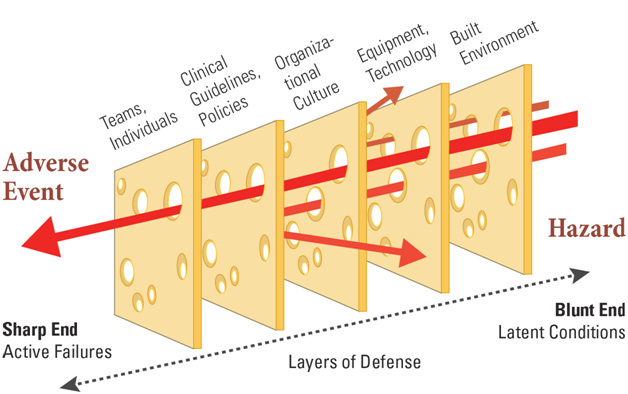 ﻿﻿The healthcare system which includes the built environment, clinical guidelines and policies, technology and tools, people and organizational culture are all designed with the intent of preventing harm to patients and staff (see Figure 1). However, holes or weaknesses (referred to as latent conditions) that adversely impact patient safety are built into the physical environment during the planning, design and construction of healthcare facilities. For example, the location of emergency departments and intensive care units might necessitate the transport of critically ill patients over long distances potentially causing patient complications. Hand-washing sinks located in inconvenient or inaccessible locations might result in poor hand hygiene compliance among physicians and nurses, which contributes to the prevalence of healthcare-associated infections. Nursing unit areas with high levels of traffic and activity can result in distraction and interruption, leading to possibilities of medication errors. ﻿Figure 1: Organizational vulnerabilities and poor outcomes in healthcare. Adapted from: Reason, J.(2000). Human error: Models and Management, BMJ, 320, 768-770. ﻿﻿﻿These problems are difficult and expensive to address once a facility has been built and occupied. Facility replacement and renovation projects provide an excellent opportunity to pro-actively identify and eliminate building-related latent conditions that may lead to harm for patients and staff. It is really critical to think about these issues during the early phases of the design process. Designing a healthcare facility is a complex process, which requires a careful balance of many priorities. From the first moment a facility project is considered, it is critical to make safety a priority, so that safety issues are immediately identified, and become a central focus of all subsequent planning, design and construction activities. It is usually cost-prohibitive to ameliorate design related safety concerns once a building is under construction, built or occupied. What does it take to make safety a priority during the facility design process? While improving the safety for their patients and staff is a key priority for most healthcare organizations, they do not often understand the role of the built environment in promoting safety. To ensure that teams focus on safety consistently throughout the design process requires a commitment to safety by all team members starting with the healthcare organization’s leadership. The healthcare organization should take several key steps at the different phases of its healthcare facility design project to ensure a consistent and committed focus on safety. Focus on safety as both a strategic and operational goal, as reflected in your mission, vision and values’ statements. Examine root cause analysis and other performance improvement projects to identify safety improvement opportunities. Identify fiscal improvement targets for safety outcomes that the project will help to achieve. Begin a return on investment analysis for equipment purchases (e.g. ceiling mounted lifts, ultra-violet gamma irradiation) needed to support identified safety goals. Consider the role that safety has on the brand recognition of your organization. Include safety as a key priority in the guiding principles for the project. Hire an Architecture-Engineering firm and project team with proven expertise in designing for safety. Orient the design team to your safety culture and priorities. Identify safety as a high priority during the visioning session used to launch the project. Provide the key stakeholders with an overview of evidence-based design features that research reveals contributes to improved safety outcomes. Develop a functional program that accommodates safety features to support goals. With the design team, develop statements that highlight how the proposed safety features will improve the organization’s safety metrics. Identify the base-line, pre-occupancy safety metrics that will be used for comparison purposes during post-occupancy measurements. Use different tools such as virtual tools and mock-up rooms to understand how design features may support safety culture and processes. Ensure that the design supports the desired safety concepts of operation from all perspectives: patients, family and visitors, the community, staff, material movement, equipment and technology use. During the programming and design phases, ensure that critical safety design features are not lost (e.g. during design development, value re-engineering). Ensure that critical safety design features are not lost/removed during construction. Finalize care processes’ reengineering based on the design of the new facility. Modified your existing comprehensive safety program to reflect the safety design features and reengineered processes of care. Establish training programs, which integrate the new safety design features, equipment and reengineered care processes. To the degree possible, implement the new care processes in your current environment. As appropriate, inform key stakeholders about the emerging safety focused design features. Collect the final pre-occupancy measures for targeted safety outcomes. The SRA is started during the planning phases of a project and continues to evolve with additional levels of detail throughout the project life cycle. The SRA enables a multidisciplinary group of stakeholders which may include architects, facility managers, risk managers, infection control professionals, clinical staff and patients to collectively discuss key design decisions from the lens of how they might impact patient and staff safety. Although many organizations regularly assess safety and identify risk management strategies, applying these concepts to the built environment may be new to some. The Center for Health Design, through a three-year grant from the Agency for Healthcare Research and Quality (AHRQ) and additional financial support from FGI, is creating a tool to support the SRA in the 2014 Guidelines. Six work groups of industry experts have helped to finalize content that will help guide the owner, design team, and diverse stakeholders in thinking about what conditions could be mitigated through built environment strategies. The tool is currently being further developed and tested and will be disseminated widely in 2015. While there is no silver bullet that will guarantee a safe facility or elimination of all adverse patient outcomes, the SRA requirement advances a set of considerations that align with the clinical goals of any health care organization: Primum Non Nocere—First, Do No Harm. It also supports a proactive approach to problem-solving. Rather than looking at an adverse event in hindsight and addressing the influence of the physical environment through an expensive retrofit, the SRA is intended to prompt consideration of safety early in project development. It is during planning and pre-design that recommendations can most effectively be incorporated into the project scope and budget. Thinking through safety considerations up front will have long-term cost-benefit implications throughout the life cycle of a facility through reduction of adverse events. The SRA will contribute to the ongoing development of safe health care environments that contribute to improved patient outcomes and staff satisfaction and mitigate the risks and harm associated with today’s complex health care systems. Anjali Joseph: Anjali Joseph is the Director of Grants and Research Advisory Services for The Center.A trained architect, Anjali has spoken at events worldwide spreading the word about CHDs work and resources. Her work focuses on understanding the relationship between the healthcare built environment and healthcare outcomes. She collaborates extensively and builds relationships with healthcare organizations, architecture firms as well as other non-profit organizations. She leads a number of grant funded research projects at The Center. Anjali has been published in many academic journals and magazines. She frequently peer reviews articles for journals. She currently serves on an independent review panel on military medical construction standards for the Defense Health Agency. Anjali obtained her Ph.D. in Architecture from the Georgia Institute of Technology, master's degree in Architecture from Kansas State University and bachelor’s degree in Architecture from the School of Planning and Architecture in New Delhi, India. Eileen Malone : Eileen Malone, RN, MSN, MS, EDAC is the Senior Partner for Mercury Healthcare Consulting, LLC located in Alexandria, Virginia, who supports clients embracing evidence-based design in health facility projects as a means to improve healthcare outcomes. With forty years in healthcare, Ms. Malone retired from the United States Army in 2004 having held a variety of key leadership positions including hospital commander (CEO), Army Medical Department CIO, Congressional Affairs Officer, quality assurance nurse, and several nurse practitioner assignments. She holds graduate degrees from Duke University and the National Defense University and is Evidence-based Design Accredited and Certified. In addition to many military awards, Ms. Malone received The Center for Health Design’s Change maker Award in 2009 and the Leadership Award from the Health Information and Management Systems Society in 2004. She currently serves as the Co-Chair for the Center’s Research Coalition and recently served as a member of the Facility Guideline Institute’s Board of Directors and 2014 Healthcare Guidelines Revision Committee. Ms. Malone has written many articles and given numerous presentations about evidence-based design and healthcare outcomes. Ellen Taylor: Ellen brings more than 25 years of experience in architecture, research and business to The Center’s research team. A registered architect and member of the American Institute of Architects, she has been influential in many research efforts ranging from guiding individual Pebble Project Partners to supporting grant-funded initiatives such as programs with the Agency for Healthcare Research and Quality (AHRQ), the Kresge Foundation, and the California Health Care Foundation (CHCF). She has a bachelor’s degree in architecture from Cornell University’s College of Architecture, Art and Planning and Global Executive MBA degrees from Columbia University and London Business School. She is pursuing her PhD in design, patient safety and human factors at Loughborough University in the United Kingdom. Ellen serves on the Facility Guidelines Institute Health Guidelines Revisions Committee, leading the 2014 Safety Risk Assessment subgroup and serving on the 2018 Steering Committee. Xiaobo Quan: Xiaobo Quan, PhD, is a Senior Researcher at The Center for Health Design. Dr. Quan focuses his efforts on special research projects, as well as our major research initiative, the Pebble Project. Working closely with the Director of Research and Pebble Project partners, planners, designers and other researchers, he examines the impact of the built environment on human behaviors and healthcare outcomes, evaluates the effects of evidence-based design innovations and disseminates research findings through presentations and publications. Dr. Quan has been actively engaged in healthcare environment research and has published widely on topics of healthcare associated infection prevention, medication error reduction, patient safety, healthcare sustainability, work efficiency, and cost-effectiveness. Previously, he worked as a Senior Researcher at Karlsberger Companies. He also worked as an architect at East China Architectural Design & Research Institute and Shanghai Xian Dai Architectural Design Group. He obtained his Ph.D. in Architecture and a certificate in Health Systems and Design from Texas A&M University, and his Master’s and Bachelor’s degrees in Architecture from Southeast University in Nanjing, China.